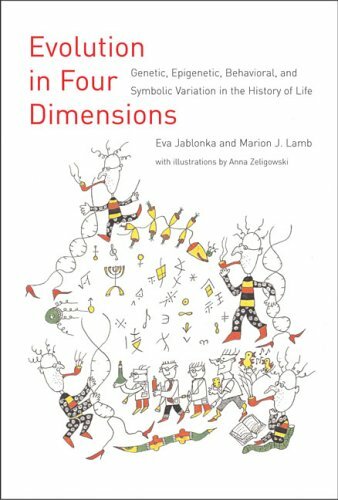 Okay, so this isn’t a book about evolving in higher-dimensional spacetime; the “four dimensions” laid out in the book’s subtitle—genetic, epigenetic, behavioral, and symbolic—all apply to evolutionary variation itself. The title itself is what caught my eye; I didn’t know there were that many perspectives/approaches/dimensions to thinking about evolution! But since it’s not immediately clear what they mean and why they’re important, so let’s take a closer look. This book is a new edition (2014) to a book published a decade ago (2005). The main thesis seems to be: “there’s more to heredity than genes”. In fact, far more. Each of the four dimensions they describe is a distinct inheritance system that plays a role in evolution. This means evolved traits are not due to pure chance alone (resulting from genetic mutation) but other factors. I’ve heard of all these four terms, but aside from “genetic” I haven’t learned about their application to evolutionary processes. It’s really interesting to think about how something like symbolic transmission (e.g. language) actually factors into a process like natural selection. “Epigenesis” seems particularly interesting because it describes the influence of the genome’s interaction with the environment…and I always love when an existing context gets expanded in surprising ways! Taken together, these perspectives give us a “a richer, more complex view of evolution” than one based on genetics alone. It’s also a “beautifully written” and “lucid and accessible text”—always important for technical science writing—and it’s illustrated! Drawings by Anna Zeligowski illuminate the concepts throughout. Flipping through the book’s “Look Inside!” preview, it’s clear these illustrations both lighten the text and visually clarify the information. Another interesting feature of the book: every chapter concludes with “a dialogue in which the authors refine their arguments” against a fictional skeptic. How often do you see that? Reminds me a bit of Gödel, Escher Bach, in which Hofstadter takes the interspersed dialogue format to delightful extremes. As one review said, this is “a science book that is a conscious attempt at good literature.” Truth be told, one of the reasons I hesitate to buy books like this is a concern that they’ll be dry, inaccessible, over my head. Luckily that doesn’t seem to be cause for worry here!